As part of a lifestyle change we’ve made, we’ve recently moved to a more rural location, surrounding by cattle. While we’re still within a town, we now have cows off our doorstep and in our back yard! As a result, we’re getting an up close look at the “humane” raising of these animals intended for food. 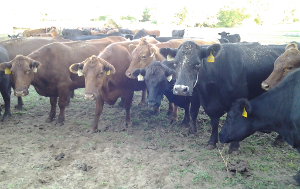 For the most part the animals do get to graze in pasture and live much more naturally than they would in a CAFO. But it’s not all sunshine and roses. While many cattle are in typical farm pastures (think large, rolling hillsides), others are in smaller enclosures that just happen to have some grass and weeds. When it runs out the workers bring in supplemental hay. The cows are herded around from place to place frequently (here they use four wheelers) and are goaded – even hit – if they do not comply with the worker’s desires. They are frequently moved from pasture to pasture, sometimes by truck. Mothers and babies are separated and bellow for each other for DAYS. This is not an exaggeration. Some animals in particular do not like being alone and call out for the others that they can hear in nearby pastures. If another animal is put in with them, they stop. Bulls are almost always isolated from the rest of the herd. Cows are marked/branded and have ear tags put in without pain relief. They yell out while it’s happening and for quite some time thereafter. Cows are sometimes left in pastures without access to shade or shelter, even when it’s 100+ degrees. When something upsets the herd, they all get anxious. This typically includes a lot of loud mooing and pacing. It continues long after the initial upset has occurred., It’s easy to tell when they’re distressed, a very unsettling sound. These cows are raised using the more “natural” methods embraced and approved by animal welfare organizations. They are considered “grass-fed”. The treatment is Certified Humane. But it should never be considered compassionate. While I will admit this is an improvement over veal crates and feed lot life, it’s still not enough.The animals are still treated like property, torn from their families, and have absolutely no say over their fates. There’s a reason they refer to animals as live stock. It is beyond me how organizations that say they are dedicated to animals can promote this nonsense. Humane meat is a myth. The best way to help farm animals is not to treat them better before killing them, but to stop eating them! This entry was posted in veg on September 27, 2013 by admin.